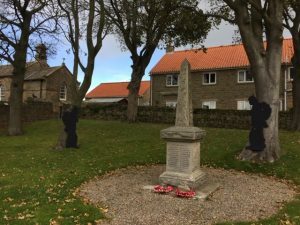 Stainton Village is situated 1 mile north of Barnard Castle and has outstanding views over the Dales towards North Yorkshire. 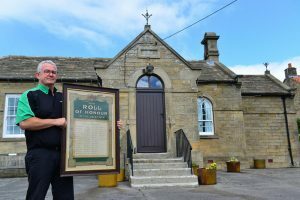 The area was surrounded by army camps in the past and is now well known for Stainton Stone which is produced at a quarry in the village. 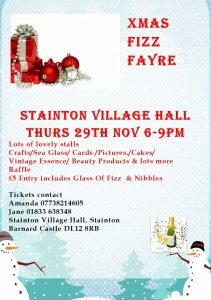 The village hall, which was the old school, is run by the Stainton and Streatlam Village Hall Association. The size and layout of Stainton Village Hall makes it an ideal choice for private and business functions. Regular activities ongoing in the hall include tea and chat and WI. Rooms: Main Hall 13m x 5m. Small Hall 5m x 4m. Heating: Available throughout hall, a new gas central heating system has recently been installed. Facilities: This hall has a stage making it a suitable venue for stage productions. The kitchen facilities include a double oven cooker. Equipment: The hall has adequate chairs and tables and there is ample crockery and cutlery available. There is also a small stereo system and a PA system available. Parking: No designated car park, roadside parking available. Access: Steps to entrance, wheelchair access to rear but not to WC. Garage & yard sale throughout village & Table Top in the village Hall. £10 Entry includes Fever Tree Dartington Glass, 1 drink and nibbles. 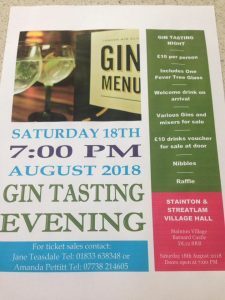 Further vouchers available to purchase various gins that will be on sale. Start Time: Runners to convene at Village Hall no later than 10:00am to collect race numbers. Winners trophy for first male and female plus finishers medal for all runners and free breakfast bun back at the Village Hall on receipt of race number. Refreshments, tea, coffee and cake, available to purchase for all family and friends. Contact Amanda Pettitt (e-mail: amandapettitt10@sky.com) for more details. A special thanks to Dennis Hinchcliffe and Teesdale Event & Site Services (TESS) for their kind support providing use and access to land and facilities. Donations for Afternoon Tea in aid of Royal British Legion. Wall of Poppies/ Tommy soldier images will be displayed at the hall and in the Jubilee Memorial Gardens.